Walking Woman: combining inner and outer activism, seeking the balance, assuaging the artistic soul and in the blink of an eye, inspiring. You are cycling down Park Street in Bristol, probably relishing the wind whistling past your ears and the joy of a downhill run with a view, and as you zip past the shops, you spot two women, dressed in white, faces still and serene, walking with ceremoniously slow steps along the pavement. Then, just as quickly, you have passed them and they are gone from sight. What that momentary glimpse creates in you, what it inspires, how you interact with it, what you feel, how you interpret it, what you think, what you do because of it, may fuel a wonder that leads you to fertile ground. Walking Woman was an action manifested by two women, Angela and Miranda, as part of Bristol Co-Mutiny on 17th September 2009, and here we reflect on what we did and how it interconnected with the Co-Mutiny space. Walking Woman is many things at once and it is rich in both symbolism and action. It is meditative and animated; it is inner activism connected to the outer world; it is balance and it is change. Walking; one foot then the other; in that way we can scale a mountain and cross a continent, we can see how in small stages great things are achieved. We learn patience through walking; we feel calm and present and grounded to the earth. By combining walking with meditation we quiet the mind and we do not flee ourselves. We can be in this reality and allow growth to occur in us. Action and activism take many forms and we should celebrate this range, for each creative action will inspire many more. Just one creative action can feed a nation. Creativity is bringing the soulful into your external world; we can infuse the mundane with the divine; we spiral upwards. This walk was both meditative and animated because it was two people seeking to be and do simultaneously in space and time. Some might say we behave like this all the time, but in reality, we do much more than we are, unless we really intend otherwise. The interplay between the walking-meditating and the action of outwardly moving in and among the public in the centre of Bristol was also fascinating. It felt like balancing on a tight rope, inner calmness and yet in, of and relating to the world; the eyes open, awareness fluttering between internal and external; intending a message and a will to maintain composure, meditation and centre. Mostly activism is considered an external act, something tangible which will bring about a series of external consequences, but activism is also within us, constantly and inevitably, and we have the ability to direct its course. By bearing with ourselves, our conflicts and joys, we can integrate our disperse parts and channel our psychic change. To my mind, the Co-Mutiny is an amazing manifestation of animus focused on bringing about social change by seeing and acting outside the system. It felt so relevant to offer an action of inner change to this space, as our external actions are defined by our inner world and we cannot and should not nurture one without nurturing the other. Click this link: MAP OF CONVERGENCE SPACE for a googlemap of it. The phone number in the building for anyone is: 07805756159 (this is also the number for the media to call). This is a huge building where people who are/want to be involved in Co-Mutiny can come and sleep and eat, meet and discuss, plan and skill-share! Any ideas that you have had for this coming week, bring them and make them happen! Come find out what’s going on, what activities there are during the week, and to get more people involved in your preparations. Check out the timetable and film nights for details of events, and pop in whenever! Everyone is invited to come down and get involved with sorting the place out, joining in discussions and sharing ideas and skills! Nearest Train Station: Clifton Down Station click HERE for directions from there. There are buses and it is a short walk from the centre of town, from the foutains, up park street, TURN LEFT AFTER THE NEW WAITROSE! Entry is by the door on the right hand side of the building, where the gravel and carpark is located. Just walk on by our local bobbies, they’re just sitting in their vehicles, with their engines on most of the time, not posing a threat. NEXT MEETING is at KEBELE, 14 Robertson Road 7.30pm Wednesday 9th of September @ Kebele, 14 Robertson Rd, Bristol. Provisional Co-Mutiny Timetable is out! 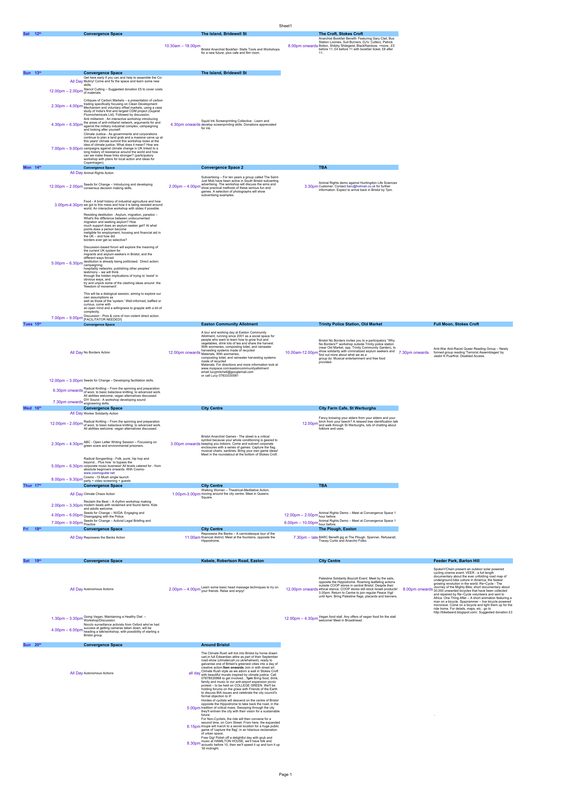 It is in .pdf format and is quite large, so have a zoom on in! Please send any information about events, skill-shares, workshops etc. 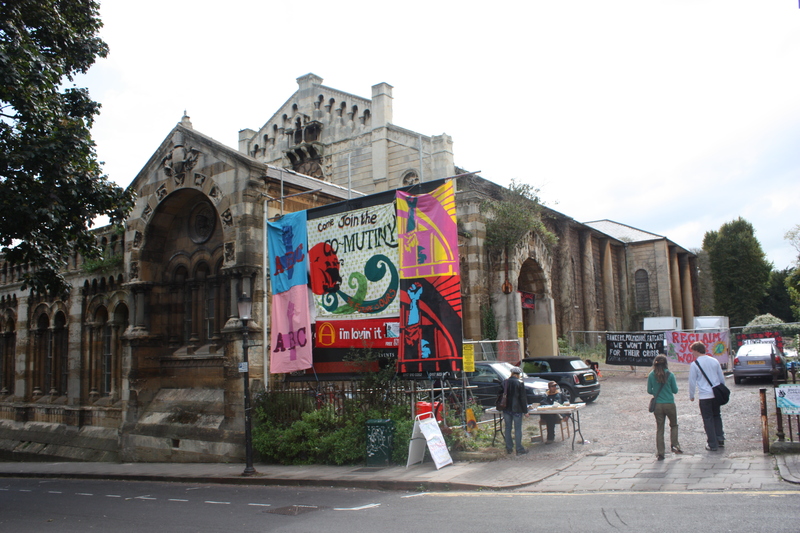 to bristolcomutinyworkshops@riseup.net asap! next full-meeting: 7.30pm Wednesday 26th August @ Kebele, 14 Robertson Rd, Bristol. 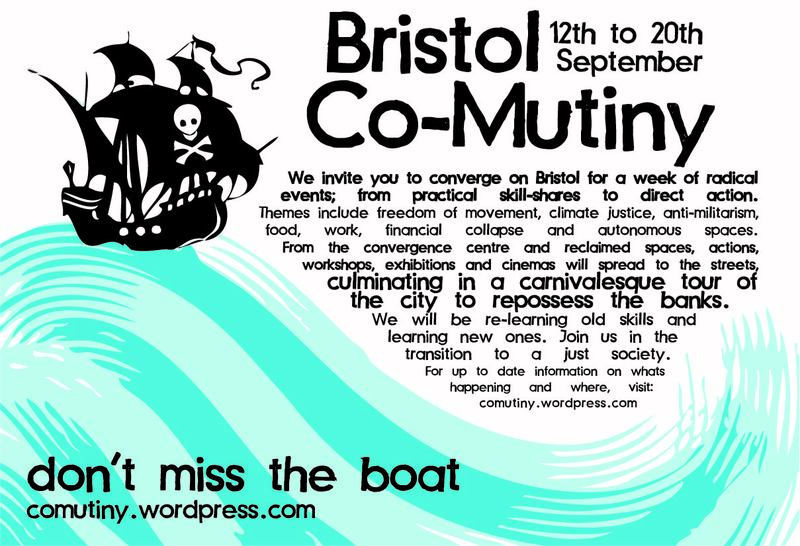 If you have information as to what you (as groups or individuals) are planning to do, whatever it may be, during the CoMutiny, and you want it in the programme of events please email through to: bristolcomutinyworkshops@riseup.net. If there are any questions, suggestions or wishes to get involved come to the next meeting or email comutiny@riseup.net! As part of Co-Mutiny we are producing a newspaper, geared to ‘the people of Bristol’ to explain our plans, politics in an accessible way. This will also include the timetable of the workshops/actions/films etc. Pieces should ideally be amusing, accessible language and include images, cartoons, pics, logos. They could be by groups involved or local or wider issues that are linked to the general project of Co-Mutiny. 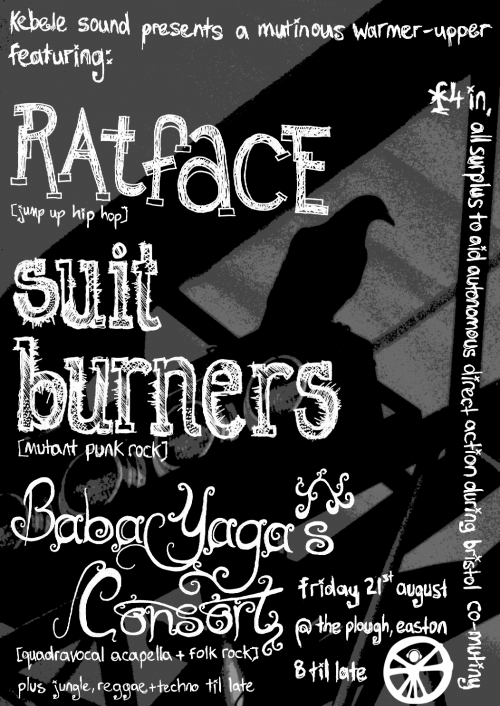 Deadline for articles and contributions with high-resolution images, cartoons, pics, logos etc: Wednesday 26th August 2009. If you cannot do something by then but would like to have something in paper that we can pull off web, please email us.